Leo Scheck (center) looks on during Associated Student Government Senate. 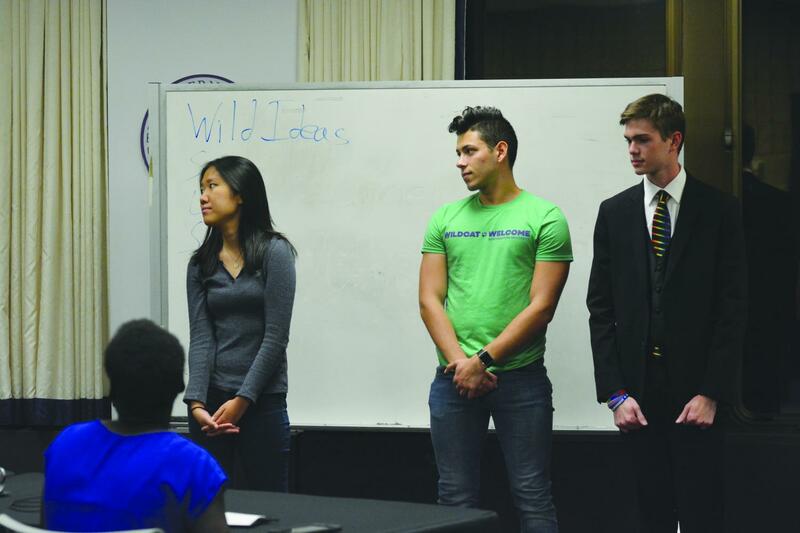 The Communication sophomore was elected to the Wild Ideas committee at Wednesday's Senate. Associated Student Government Senate elected Communication sophomore Leo Scheck to the Wild Ideas committee in its first meeting of the academic year Wednesday. Scheck, a senator for the Student Theatre Coalition, told The Daily he was excited to build on his experience with ASG in the committee. Scheck beat two other senators in the election for the committee, which allocates funds to students or groups that don’t get funded under the A-status or B-status committees. Chief of staff Lars Benson, who chairs the committee, told The Daily that Wild Ideas has $25,000 to allocate to students and student groups for the whole academic year. Benson said he’s excited to work with Scheck on the committee. “I was very impressed by his clear concept of what accessibility means on this campus and his focus on particularly financial accessibility and meeting the needs of students who aren’t able to attend a lot of conventional events,” the Weinberg senior said. During the election process, senators and members of ASG’s executive board asked the candidates what qualities they look for in ideas that could be funded by the committee, and how they’d proceed if a group they’re involved with applied for funding through Wild Ideas. Vice president for academics Sky Patterson also asked the candidates to pitch a potential idea for the committee. Sumin Woo, another candidate for the spot, said if elected, she’d allocate funds to groups that had previously put on successful events. The Wild Ideas committee is made up of 10 members, including Benson, who only votes in the case of a tie. Benson and Scheck both said Wild Ideas is critical to ASG’s purpose because it gives opportunities to students who wouldn’t otherwise have them. All Wild Ideas events are free to students, Benson said. “Wild Ideas enables us to empower those students to first of all create new student groups and new opportunities but then also to bring speakers that they’re really interested in, to host events that they think are important or to do projects that they think matter to campus,” Benson said. Senate also confirmed all 15 residential senators, who were elected earlier this month. In addition, two senators were elected to a committee that will select a vice president for health and wellness to replace Weinberg senior Olivia Paulhac, who resigned over the summer. The committee will present its nominee at next week’s Senate. Finally, Senate elected two senators to the distinguished Honorary Teaching Award Selection committee.